A simple and quick recipe for a warm and hearty soup. I prefer to use Bushes Brand of canned beans but you can use what you want. You can even soak your beans and make this from dried. But that isn’t so quick. Open the cans of beans and put them in a sauce pot along with the chicken stock and all remaining ingredients. Using a immersion blender, slightly puree the soup just enough to break up some of the beans, but not all of them. If you don’t have an immersion blender, then place a generous cup of beans into a blender or food processor or even mash them by hand. Add the mashed beans back to the soup. Bring to a boil, stir frequently while preparing the garnishes. Ladle the soup into soup bowls, garnish with desired garnishes. Serve with tortilla chips and salsa on the side. This entry was posted in Recipes, What every good cook should know. Bookmark the permalink. 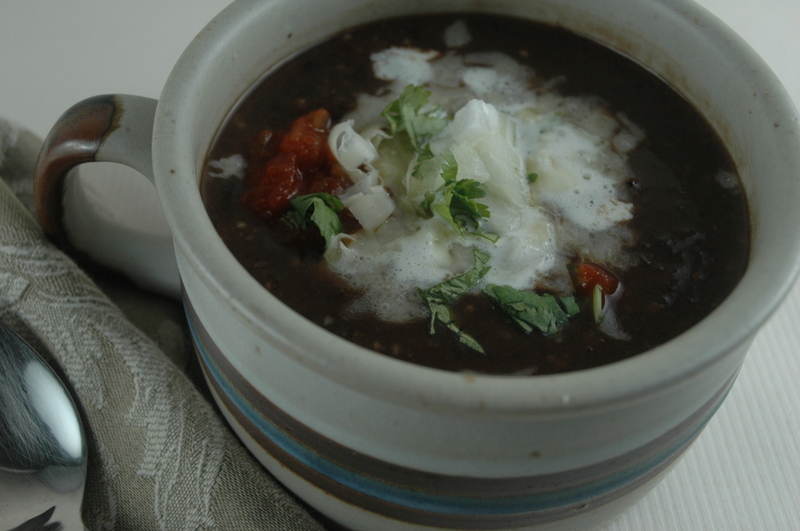 I’ve been a connoisseur of black bean soup for many years and this one takes the 1st Prize Ribbon!